Colossi of Memnon in spectacular Luxor, Egypt. I’ve always reveled at the fantastically accidental nature of life. My family emigrated to the United States from Egypt. Not surprisingly, that fateful decision entirely transformed the sequence of events that followed and ultimately shaped my life. In fact, my parents’ decision to emigrate so transformed so many aspects of my life that I struggle to imagine what life would have been like had their decision turned out differently: emigrating to another country or perhaps staying home altogether. Their decision to take the monumental life risk that is emigration to a foreign country was itself the result of other events that transpired earlier in their lives including opportunities they each took to study abroad; these short-term opportunities showed them that they can succeed abroad on a longer-term basis. 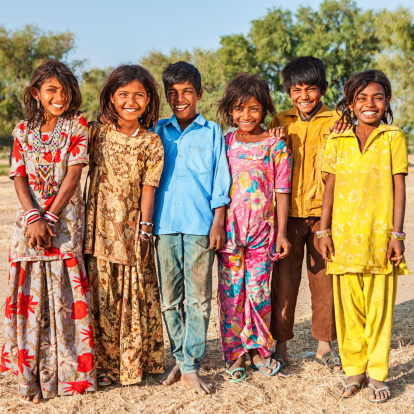 A group of children from a desert village in India. Their customs, dress, dialect, and so much else was given to them by happenstance. As I consider the most important aspect of mine and my wife’s lives today, it’s easily our children. Despite their importance, I must acknowledge a fact that, despite being difficult to consider, is rather objective: our children are a direct result of the relative happenstance of my meeting my wonderful wife in the United States and our decision to marry and have children. Can I thus trace my children’s existence all of the way back to my parents’ studies abroad? I genuinely think so. It’s an unavoidable fact: happenstance determines so much of our lives. The vast majority of the world lives in the same town in which they were born or within a few miles of there. Their birth place was entirely beyond their control, yet, despite that, it significantly impacted where they most likely end up living. Most people’s philosophical and/or religious belief systems are completely aligned with their parents’. While a minority of people depart from their parents’ beliefs, most don’t go too far. Many would argue that their beliefs are some of the most important dimensions of their lives and, once again, they’re nearly predetermined for us at birth. Our cultural norms, our speech dialects and/or accents, and even how we dress are all a result of arguably coincidental circumstances well beyond our control. The list could go on, but I won’t :-). A very common meal eaten in Egypt: “Tameya” or “Falafel”. It’s more than habit; it’s tradition. So, if happenstance shapes so much of our lives, is there room for much else? In his book, The Power of Habit, Charles Duhigg argues for what I believe to be the second critical component shaping our lives: our habits. In his book, Duhigg argues rather convincingly that our lives are not shaped by individual decisions we make on a regular basis but, rather, by the habits we develop. Our morning routine is likely nearly identical every day from the the way we shave our face (e.g., I notice that I always start with my left sideburn) to the way we put on our pants (I start with the right leg) to what we tell our children as we wish them goodbye. Consider when the last time you actually thought about the route you take during your morning commute to the office. It is likely so well-programmed in your head that it is essentially a habit you can do nearly blindfolded. OK, may be not quite blindfolded :-). Once you arrive at your office, think of the first few things you do as they’re likely replicas of what you did the prior day. For me, it’s docking my laptop, placing my snacks for the day in my fridge, and immediately validating no urgent e-mails are waiting for me. So, how do these habits shape our lives? Well, aside from the aforementioned habits determining how and where we spend our lives, consider other habits such as our dietary pattern. While it might seem to each of us that we eat a great deal of variety of foods, if one were to track the foods they eat in a diary, they’d be quite surprised by how repetitively consistent they are. The habit of jogging. Rockaway Beach, Oregon. Consider another habit: exercise. Have you noticed how there are those who exercise and those who don’t, but few people in-between? Those who begin to exercise ultimately end up as either habitual exercisers or they simply give up. It’s a matter of whether one is able to successfully adopt exercise as a habit or not. Those two habits alone, diet and exercise, shape so much of our health and quality of life. Other habits, like smoking, affect not only our health, but also impact our personal brand, our social circles, and our friendships. These days, it’s not uncommon in office buildings to have small clans of friendships based on smoking; these small groups take “smoke breaks” together no less than daily. The study habits we develop early in our elementary school (read “grammar school” for my friends across the pond) years shape our success during our college years and perhaps even our ability to focus on problems later on in life. If you think about it, these two concepts so overwhelm shaping our lives that they don’t leave room for much else. In comparison, our ad hoc decisions are much less deterministic of our lives. Take, for example, my parents’ decision to emigrate; seen on its own, I could imagine it as an ad hoc decision. However, while perhaps the fact we traveled across the ocean and landed in Utah were somewhat deterministic, nearly everything else that was precipitated by that were completely happenstance: our friends, our spouses when we eventually married, and even the specific jobs we took on. The good news for us is that, while we can’t control happenstance, we can in fact transform our habits or adopt entirely new ones. Our habits provide us a much more predictable, controllable avenue to shape our lives. It is through our habits that we can gain a sense of self-governance over the otherwise very circumstantial and happenstance timeline of our lives. Good Observations! I share something similar being an immigrant myself. Yes, what we can control is only what we can do, what habits we cultivate and how we see ourselves. Raju, yes, I imagine you quite relate to how differently your life has unfolded since your arrival here. Likewise, your relocation within the country will, I suspect, be quite a (hopefully very positively) memorable event for your own children. Thanks for sharing your thoughts. I hope I can teach my children about the sacrifices of their ancestors, it might instill in them respect and appreciation for their heritage. Like you are doing…. The power of Habits is a great book. For those that have not read it, I would strongly recommend it.